Please enter an amount into the form below to purchase an Original Painting, make a Payment, or a Commission Deposit. 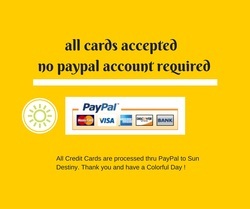 All Credit Cards are processed thru PayPal to Sun Destiny. Thank you and have a Colorful Day !